The British have always loved to bet on anything and everything. But few ever went the lengths William Douglas, 3rd Earl March and later 4th Duke of Queensbury, did to win bets. Even those who seemed against all odds, like the “Race against Time”. That’s the name given to his most famous bet. 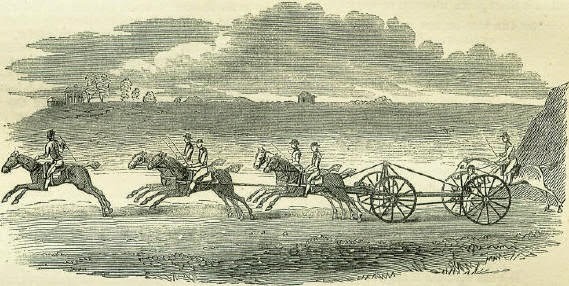 Lord March wagered that he could race a four wheeled carriage, carrying a man, over a distance of nineteen miles in one hour. The state of the roads back then was very poor, and this type of carriage was heavy and slow, with no springs. To many, covering such a long distance in that short amount of time with that coach was simply an impossible feat. But not to Lord March. William was a very ingenious man. He respected the rules, but also examined them carefully to figure out how to use them to his advantage. That’s when he realised that the terms of the bets didn’t say anything about a carriage body. It wasn’t required, and so he had it removed. Actually, he had commissioned his carriage makers to make a few carriages, stripped of everything that wasn’t absolutely necessary, and then had them tested to find out which one was the lightest and fastest. To further reduce the weight, the carriage makers were ordered to use silk for the traces and whalebone for the harness. The carriage now weighted only two and a half hundredweight. Finally, the grand day arrived. On 29th August 1750, at 7 in the morning, Lord March was at Newmarket Heath, to see his poor groom ride the coach (or what was left of it). There was no seat, no support, and not much to cling onto too. The groom must have felt very uneasy as the horses took off very fast, covering the first four miles in just under nine minutes. The whole distance was covered in 53 minutes and 27 seconds. Lord March happily collected his winnings.